So Mark's article is wishful thinking and hoping to ride the wave that Red Hat (and Novell) are funding. If he can use that same kernel, with the same backports, fixes and regressions tests, Ubuntu LTS does not need to do anything to support the same vendor hardware. Easy, but at the expense of both Novell and Red Hat. That explains why Mark wants 2 out of 3 Enterprise Linux distributions to enter his circle. I could imagine Novell and Mandrake joining forces to align the release cycle to try and take on Red Hat's 80% Enterprise Linux market share (sales, not necessarily install-base). There is hardly any benefit in Mark's proposal for Red Hat. I am a heavy multitasker. I run a lots of apps at once.. sometimes to the point where this dual screen 22" + 14" setup still feels like I need more screen. However, screen space is not the primary problem, but RAM/Swap utilization instead. Its not unusual for me to have 95%+ RAM 90%+ swap (on a 1.2GB RAM with 1.2GB swap machine) utilization with all the apps I ran and freeing the RAM is kindof a tricky task. I usually use ps and top to detect apps that consume a lot of RAM and stop them. However, the values shown on the commands are hard to be quickly identified due to the scheme of Virtual, Shared, Resident, Swap does not show the values on how I would expect it to be. So I went googling and I found out about a very ancient tool ported from SGI IRIX called gmemusage. 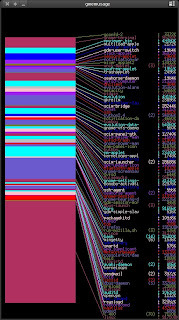 It shows a graphical representation of the memory consumption by apps running on the system in a quite useful display. A great article about Luke Macken's LiveUSB-Creator on Lifehacker: http://lifehacker.com/391067/fedora-9-puts-your-desktop-on-a-usb-drive. The implementation in theory might be possible to create a Wubi-like installer for Fedora. Perhaps it will be possible some time in the future with this. They struggled trying to keep the betas in control. Inclusion of too new , latest technologies caused breakage and other problems to Ubuntu 8.04 Hardy Heron. Harald Hoyer wrote a good comment out of the responses to Mark Shuttleworth's post about synchronizing distro releases. Ubuntu should stay as they are. Its a good distro for me to recommend for those users who just want a JustWorks machine with no interest to contribute to FOSS world. Fedora development is admittedly way too fast for those type of users to bother. If Ubuntu tries to follow Fedora rapidness, that won't solve anything (except, maybe, open a way for grabbing the Fedora contributor/userbase to the Ubuntu side). Ubuntu has been a good player in trying to solve their bug #1. So, keep it that way. The Fedora path is too hostile for Ubuntu current target market. Something off-topic once a while. Went experimenting with the microwave oven just now, wondering if I can make something more tasty than a plain instant noodle. Went through the freezer and thrown in some stuff, and it turned out great!. Maybe someone want to try it out, here's the recipe. Boil water and put it into a microwave safe bowl. Take out the frozen stuff from the freezer, wash it and throw them into the hot water. Throw in the miso paste and margarine too. Open up the instant noodle, and put the soup stock into the bowl. Put the bowl into the microwave oven, and heat it up until its boiling for 30seconds or so. Stir. Put in the noodle, restart microwave for 2 minutes. Eat :P.
I've been wanting to do this, several times since F7 but kept forgetting due to occupied with stuff. I have put together a complementary ISO containing a repository containing some Livna packages, OpenOffice, and a bunch of stuff which I guess might be useful to users. It is generated using the i686 LiveCD as the root for dependency checks, so, its dependency compatible with the official i686 LiveCD. I'm not sure how beneficial this ISO will be. But I guess it can help our users who does not have big bandwidth to grab certain stuff. Also helps for people who want a kindof-complete desktop environment without being online to grab from stuff from the repos. I'm the only one seeding it, so, seeding help is really appreciated. Its out!! Its out!!!! Fedora 9 "Sulphur" Is OUT!!!!!!!!!! With this announcement, its now official!!!. Fedora 9 "Sulphur" has been released!!! The Release Summary describes very well on whats the latest and greatest OSS technologies offered by this release of Fedora. Grab it NOW while its still hot!. However, for those who have fallen slave to the proprietary NVidia/ATi drivers, grab it now only if you are brave - because your vendor could not catch up with the latest and greatest of OSS. 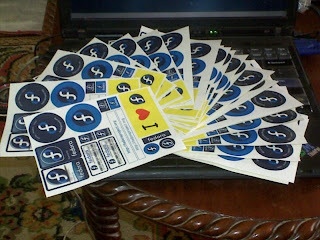 With Fedora 9 released, Fedora 10 have started rolling, and the cycle of innovation and creation begins again!. For those who are upgrading from Fedora 7 or Fedora 8, give PreUpgrade a try!. It allows an almost-live upgrade from your old Fedora release to Fedora 9!!. RPMs for preupgrade with F9 listed as an option are available / pointed here. LiveUSB, PackageKit, PolicyKit, FreeIPA, easy partition resizing, one-click encryption, RandR support and a faster X, TeXLive, Firefox 3, GVFS, ext4, GCC 4.3, and so much more.... There are far too many improvements to list them all, but certainly even to the naked eye there are worlds of difference between our present and our past -- and the change is overwhelmingly for the better! Go check out the full list at ﻿http://fedoraproject.org/wiki/Releases/9/FeatureList on the wiki. ﻿All of this work is done with our constant, unwavering commitment to upstream -- making sure that the Fedora Project always donates back to the source from which we draw. When we find opportunities for improvement, we share that with our upstream contributors to make sure that all open source participants benefit. I need to export plone accounts from Inigo Intranet to LDAP. To accomplish that, first I need some way to export the data I need. Plone itself does not have such tool for it (that I know of). Not so long ago, Kaeru pointed me to a zope script for such purpose, however, the script fails to extract passwords from Plone3.0 mainly due to passwords are now managed by the PluggableAuthService - which made getPassword() to return None and _getPassword() to raise NotImplementedError. I don't know whether somebody forgot to implement those functions into PAS or it was purposely done. Googling lead me to this page in plone.org and from there, to this other script. Again, none of them able to extract the password hashes. I lost hope with google, and to the source I went. After a whole night digging through the plone source, at last, I managed to found the method to extract the hash. So, heres the External Script which I wrote to extract stuff I want. Saw this in Planet MyOSS today. Hey!! Its my life too!!!. Call me impatient of whatever. I've been wanting to use Mozilla Prism. It is not yet packaged in Fedora so I tried my luck to package it properly for Fedora. However, I totally have no idea how Mozilla buildsystem work and how to compile Prism's trunk on Fedora. Trying to follow the Creating XULRunner Apps with the Mozilla Build System lead me nowhere. I got stuck trying to find what package provide the buildsystem and the "client.mk" file, but I given up due to I totally have no clue. In the end, I ended up packaging the official binary tarball released by upstream and make it installed in /opt. Sulphur release is getting very near. With all the improvements on F9, somehow, it made me very anxious imagining how RHEL6/CentOS6 would be. With all the improvements Fedora have brought in since Fedora 6, I can only imagine that RHEL6/CentOS6 would be a great distro to recommend for people who don't want to upgrade their distro every half or full year. With all the device support, the EPEL repository, the giant improvements on yum, PackageKit, FreeIPA, new Xorg, and lots of goodness of a desktop distro, if all these made it into RHEL6/CentOS6, I am nothing but very happy and excited. RH is abandoning the desktop?. So what?. They let the desktop world move on its own, freely, and Fedora _is_ that desktop. What got in Fedora, got into RHEL too. With CentOS set loose on the internet, high quality Free (both philosophy and price) environment is not that far away from reach. ^-^.